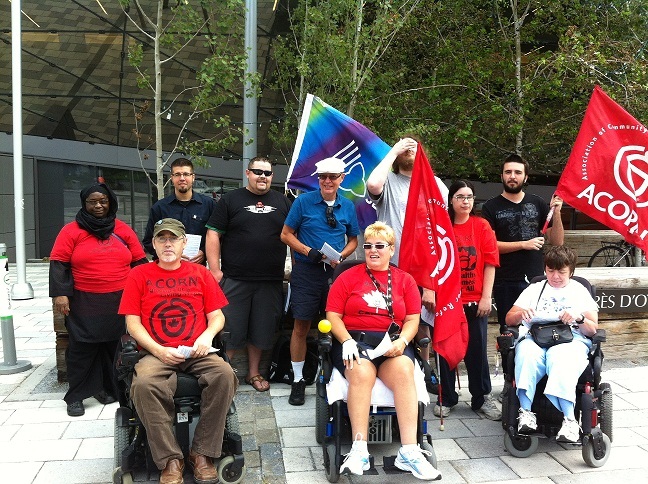 ACORN’s Disability Rights Group is a growing organized body of disabled British Columbians demanding livable allowances from the Provincial Government. They are holding their second monthly action as a part of the rights-based campaign for livable income. ACORN Disability Rights Group is a large group of determined disabled people committed to justice. They believe it is their human right to receive a livable income. An immediate increase of PWD rates to $1200, and review of what amount of money is needed for disabled people to meet the cost of living. Make the benefits accessible for disabled people by cutting needless bureaucratic red tape and automatically getting recipients the benefits they are entitled to. Roughly a dozen people, mostly with disabilities, gathered outside a Burnaby welfare office Wednesday, demanding the government increase their monthly benefit payments. "We're fed up being treated like a bunch of beggars. We're angry and we're not going to be silent any longer," said New Westminster resident Tom Page, spokesperson for ACORN, a social justice organization. 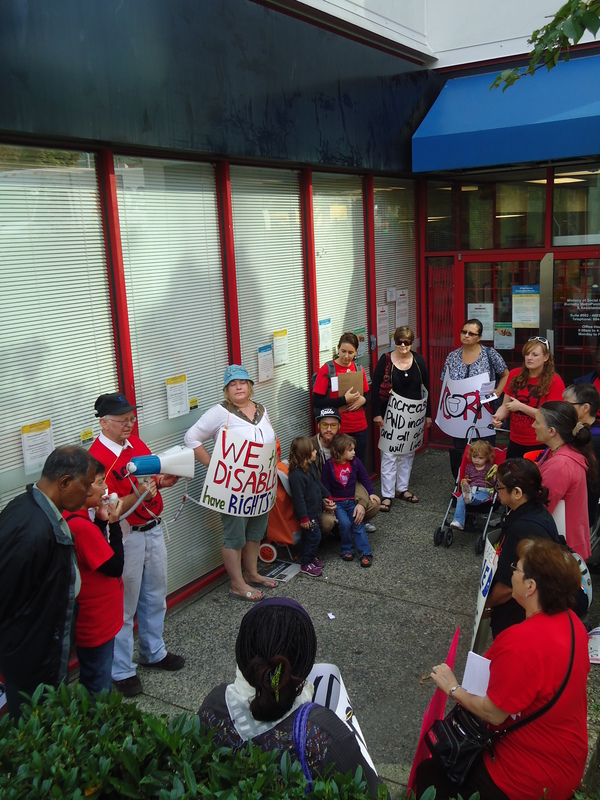 ACORN's disability rights group was holding the demonstration on Wednesday morning on the corner of Kingsway and McKay Avenue near Metrotown. According to Page, people receiving disability benefits from the government live in "abject extreme poverty" receiving only $906 a month (which translates to $10,872 annually), while Albertans receive $1,588. "B.C. has one of the highest costs of living in Canada, but the disability rates have fallen to sixth place," Page told the crowd through a megaphone. Page also bemoaned the difficulties and wait-times to get on disability and the fact that benefits are not retroactive to the date of application. ACORN wants the disability rates raised to $1,200 immediately, followed by a study to come up with a livable rate that's indexed for inflation. According to Page, who's on disability, the government hasn't increased the rates since 2007. Ottawa ACORN Teams Up with OPSEU to Stop the Cuts! Ottawa ACORN has been working hard in the last month to collect signatures on a petition to protest proposed cut backs to the “community start up and maintenance” benefit. Dalton McGuinty’s government is planning on cutting the benefit in January 2013 and ACORN, along with other community groups, are DEMANDING a reversal! ACORN members teamed up with OPSEU and spent the Pupusa Festival and Labour Day festivities collecting HUNDREDS of signatures on a petition to STOP THE CUTS! We won’t let McGuinty push low income folks around. To sign the petition, contact the Ottawa ACORN office. Read more about Ottawa ACORN Teams Up with OPSEU to Stop the Cuts! EMC news - Members of ACORN - a poverty advocacy group - challenged the Ontario premier to put food in the budget with a protest held in front of a Food Basics on Merivale Road on May 24. Kathleen Fortin, a member of Ottawa ACORN's board, said the stagnant rates of social assistance don't work with the rising cost of food. "It just doesn't add up," she said. She says that she and her partner are both on disability and can barely make the rent each month. "My boyfriend has had cancer and can't work because of it. His diet is restricted and expensive," she said. "Is he supposed to stop eating properly because he no longer has enough funding to do so? No. We're just going to have to find the money we don't have." ACORN says it has about 1,600 members in the Ottawa area and Fortin said they challenged Dalton McGuinty to try and pay for the monthly food and grocery bills while receiving a meager allowance on social assistance. 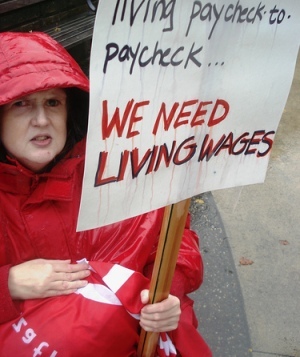 ACORN Canada member challenges premier to live on $1,040 a month. The poor are getting poorer and the rich are getting richer was the statement repeated through the microphone Friday as grassroots organization ACORN protested the latest budget outside Dalton McGuinty's office. There were about 50 people in attendance to speak out against the social assistance freeze and the child tax benefit cuts that were announced Tuesday in the provincial budget. Though McGuinty was in Ottawa on Friday to speak about the budget, he was not at his constituency office during the protest. Office staff locked the door and closed the window blinds during the protest. 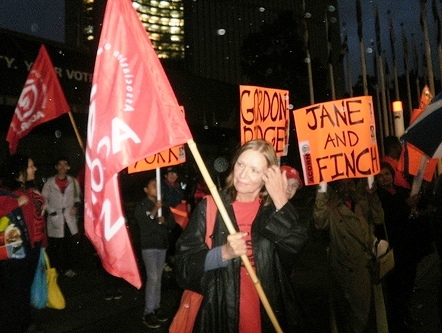 Kathleen Fortin is a member of the board for ACORN and has been part of the organization for four years. "I'm here to speak for those who can't speak for themselves," said Fortin.